This is the title of my exhibition at Whitchurch Silk Mill. Using walking as a method of storytelling, it is about journeys. 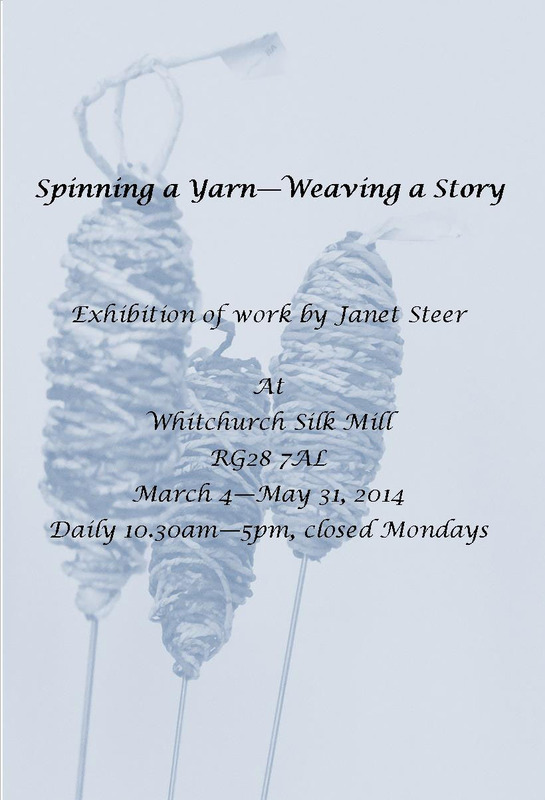 I have spun and woven maps and newspapers to create the work on show. A few pieces were shown at the Knitting and Stitching shows last autumn but there is new work as well. There are two large cabinets, upstairs contains a formal display, downstairs is a more informal collection, designed to give some background to the upstairs exhibition. The Mill itself is well worth a visit, with a wealth of information and displays about weaving processes and machinery in its handsome buildings on the banks of the river Test. At the moment there is a glorious carpet of purple crocus flowers on the lawn beside the fast flowing water below the tea room windows. The Mill is open daily from 10.30am – 5pm but note it is closed on Mondays. The exhibition is on until 31 May.